Oil finished slightly above $102 a barrel on Thursday. It still remains slightly above 4% of GDP. That it has refused to budge below $98 even after the bad economic news of the last several weeks is especially concerning. I guess it's going to take more serious "double-dip Doom" news to drive the point home to speculators. On the other hand, gas at the pump fell for the third week in a row, declining $.01 more to $3.78 a gallon. Gasoline usage at 9163 M gallons was 0.3% lower than last year's 9194. The last four weeks have averaged equal usage compared with a year ago. On the housing front, there was good news and bad news. As to the more sales-oriented data, the Mortgage Bankers' Association reported that seasonally adjusted mortgage applications declined 4.4% last week. It was 9.0% higher than this week last year. The purchase series has now been generally flat for over a year, and this is the third in a row that YoY comparisons in purchase mortgages were positive. Except for the rush at the two deadlines for the $8000 mortgage credit, these are the first YoY increases since 2007. Refinancing increased 1.3% with the continued decline in mortgage rates. The bad news on the housing front came with the price-oriented data. With the heightened scrutiny of the decline in housing prices recently, I have added the weekly report of median asking house prices from 54 metropolitan areas at Housing Tracker. 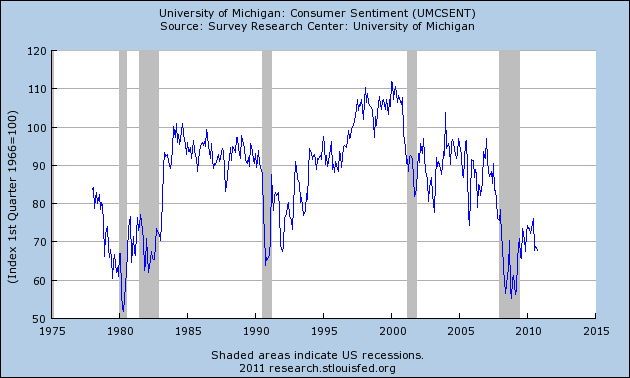 This week the median YoY decline increased from -5.7% to -5.85%. The areas with double-digit YoY% declines increased by one t o 11. 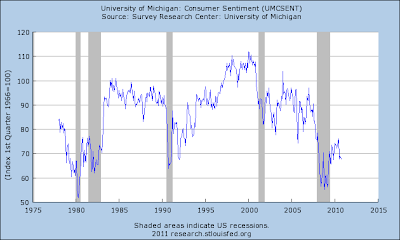 The areas with YoY% increases in price declined by one to 3. The BLS reported that Initial jobless claims last week were 427,000. The four week average declined to 424,000. We are back at levels last seen late last autumn - but still significantly lower than the rest of last year - and likewise considerably higher from earlier this year. Railfax was up 3.7% YoY for the week. It failed to update its carload or YoY percentage change data. Four week averages continued to show Baseline traffic slightly less than one year ago, and Cyclical traffic up slightly. The YoY 4 week average in Intermodal traffic (a proxy for imports and exports) decreased significantly. In summary, the YoY change in Total rail traffic is still positive, but the comparison continues the deterioration it has been undergoing since the beginning of this year. The American Staffing Association Index dropped 1 point to 93. Seasonally it should be rising. This is not good at all, although the longer term advance still looks like the first half of 2007 - slow growth, but not stalled. Any further stalling of this index would be a significant danger sign. The ICSC reported that same store sales for the week of June 4 increased 2.5% YoY, and increased 0.4% week over week. The yearly comparison here, while still good, has been decreasing in the last few weeks. Shoppertrak reported a strong 4.4% YoY increase for the week ending June 4 (the fourth strong week in a row) and a WoW decrease of 1.2%. Weekly retail sales numbers continue to be a bright spot, generally showing the consumer not rolling over due to gas prices. Weekly BAA commercial bond rates decreased another .04% to 5.70%. This yields of 10 year treasury bond decreased .09% to 3.01%. The continuing decline in treasury rates does show fear of deflation, and the smaller decline in corporate rates additionally shows a slight increase in relative distress in the corporate market. Adjusting +1.07% due to the 2011 tax compromise, the Daily Treasury Statement showed that for the first 6 days of June 2011, $44.9 B was collected vs. $49.4 B a year ago, for a decrease of $4.5 B YoY. For the last 20 days, $132.9 B was collected vs. $125.8 B a year ago, for an increase of $7.1 B, or 5.6%. Use this series with extra caution because the adjustment for the withholding tax compromise is only a best guess, and may be significantly incorrect. M1 was up 1.1% w/w, up 2.3% m/m, and up 13.5% YoY, so Real M1 was up 10.4%. M2 was up 0.1% w/w, up 0.7% m/m, and up 5.1% YoY, so Real M2 was up 2.0%. Real M1 remains very bullish, while Real M2 remains stuck in the caution zone under 2.5%. With a few exceptions (retail sales), the weekly data continue to show the slowdown or stalling of the economy (Gas usage, staffing, cyclical traffic). Signs of an outright contraction, however, remain sparse (baseline rail traffic). The bond market's signal of concern about a deflationary bust is particularly noteworthy, as is the Oil market's continued belief that $100+ oil prices are sustainable. The housing market data, however, is more encouraging in terms of the long term. Mortgage applications have stabilized without the help of any artificial support for the first time in 4 years. Lower prices mean the housing in more and more metro areas will turn into "bargains" that draw in buyers (see: Florida). In other words, home sales may have reached equilibrium, and if prices continue to fall, we could see them beginning to increase. Enjoy your weekend. I may post a weekend diversion, so be sure to check in. Vista, which makes plastic products for equipment manufacturers, spent $450,000 on new technology last year. During the same period, it hired just two new workers, whose combined annual salary and benefits are $160,000. Two years into the recovery, hiring is still painfully slow. The economy is producing as much as it was before the downturn, but with seven million fewer jobs. Since the recovery began, businesses’ spending on employees has grown 2 percent as equipment and software spending has swelled 26 percent, according to the Commerce Department. A capital rebound that sharp and a labor rebound that slow have been recorded only once before — after the 1982 recession. Is There an Economist DeLong Hasn't Read? And the interesting thing is that I almost believed that what we have seen was going to be what would happen. Almost, but not quite. You see, I had read John Hicks (1937). And I had almost believed him. Let me give you the Hicksian argument about what happens in a financial crisis--a sudden flight to safety that greatly raises interest rate spreads, and as a result diminishes firms' desires to sell bonds to raise capital for expansion and at the same time leads individuals to wish to save more and spend less on consumer goods as they, too, try to hunker down. In Hicks's model, the immediate consequence is an excess demand for (safe) bonds in the hands of investment banks: bond prices rise, and interest rates falls. As interest rates fall, (a) firms see that they can get capital on more attractive terms and so seek to issue more bonds, and (b) households see the interest rate they can get on their savings fall, and so lose some of their desire to save. The market heads toward equilibrium. But as the market heads toward equilibrium, something else happens as well: the fall in interest rates and the rise in savings is accompanied by a greater desire on the part of households and businesses to hold more of their wealth safely--in pure cash. And so the speed with which cash turns over in the economy, the velocity of money, falls. And as the velocity of money falls, total spending falls, and workers are fired, and as workers are fired and lose their incomes their saving goes from positive to negative. One of the primary reasons I love Brad DeLong's blog is he is one of the only economists who has literally read every major economic thinker of the last 200 years. As such, he brings up these great points. One of the most perplexing things about the bond market right now is this: with the US running a big deficit and with the increased threat of a budget showdown delaying a hike in the debt ceiling, why are US interest rates so low? Logic tells us the bond market should be selling off, sending interest rates to sky high levels. Let's look at Delong's statement. As investors and savers become more and more concerned about the future, they start to buy safer and safer assets. At the same time, the central bank is lowering interest rates, increasing the spread between the short and long end of the bond market. (a) firms see that they can get capital on more attractive terms adn so seek to issue more bonds, and (b) households see the interest rate they can get on their savings fall, and so lose some of their desire to save. The market heads toward equilibrium. Rather than obsessing over absolute numbers, we focus on the relative movements and flows which are quite revealing. The Fed’s QE2 program has been quite successful in flushing households and nonprofits out of their Treasury holdings into asset classes such as mutual funds (see table F.100). 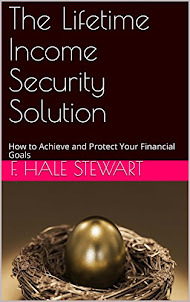 But as the market heads toward equilibrium, something else happens as well: the fall in interest rates and the rise in savings is accompanied by a greater desire on the part of households and businesses to hold more of their wealth safely--in pure cash. And so the speed with which cash turns over in the economy, the velocity of money, falls. And as the velocity of money falls, total spending falls, and workers are fired, and as workers are fired and lose their incomes their saving goes from positive to negative. The point is this passage explains what is happening right now -- both in the bond and velocity market -- very well. A big hat tip to professor Delong for reading, well, everybody. The long-term charts show a clear downtrend -- lower lows and lower highs. Also note the 200 day EMA is decidedly negative as well, as are the shorter EMAs. The shorter charts shows a decidedly negative picture. All the EMAs are moving lower, and the shorter EMAs are below the longer EMAs. Also note prices are below the EMAs. At the same time, notice the volume bars, which are larger indicating there are more trades occurring. The prospect of increasing fiscal drag on the recovery highlights one of the many difficult tradeoffs faced by fiscal policymakers: If the nation is to have a healthy economic future, policymakers urgently need to put the federal government's finances on a sustainable trajectory. But, on the other hand, a sharp fiscal consolidation focused on the very near term could be self-defeating if it were to undercut the still-fragile recovery. The solution to this dilemma, I believe, lies in recognizing that our nation's fiscal problems are inherently long-term in nature. Consequently, the appropriate response is to move quickly to enact a credible, long-term plan for fiscal consolidation. By taking decisions today that lead to fiscal consolidation over a longer horizon, policymakers can avoid a sudden fiscal contraction that could put the recovery at risk. At the same time, establishing a credible plan for reducing future deficits now would not only enhance economic performance in the long run, but could also yield near-term benefits by leading to lower long-term interest rates and increased consumer and business confidence. I have to admit, I've really grown to like Bernanke, probably because I believe both of us are "wonks" of the highest order. Above, he outlines the real issue: trying to balance the need for definitive deficit reduction without hurting short-term growth. Remember -- government spending is a variable in the GDP equation. A cut in spending by definition lowers growth. And -- as Kash over at the Streetlight Blog recently pointed pout -- cutting spending too sharply sends negative ripples throughout the economy. However, regular annual deficits over $1 trillion are also unsustainable in the long run. While some economists have correctly pointed out that the current situation in the US bond market indicates a technical default or inflation are obviously not a concern right now, all it takes is one event to shatter confidence and send yields spiking. And once that happens, getting the market's confidence is difficult, if not impossible. Just ask Argentina about its decade long woes trying to do just that. Considering the current batch of weak economic data, massive cutting should not be on the table right. But a long-term plan is clearly needed -- one that calls for sacrifice from both parties. Reports from the twelve Federal Reserve Districts indicated that economic activity generally continued to expand since the last report, though a few Districts indicated some deceleration. Some slowing in the pace of growth was noted in the New York, Philadelphia, Atlanta, and Chicago Districts. In contrast, Dallas characterized that region's economy as accelerating. Other Districts indicated that growth continued at a steady pace. Manufacturing activity continued to expand in most parts of the country, though a number of Districts noted some slowing in the pace of growth. Activity in the non-financial service sectors expanded at a steady pace, led by industries related to information technology and business and professional services. Consumer spending was mixed, with most Districts indicating steady to modestly increasing activity. Elevated food and energy prices, as well as unfavorable weather in some parts of the country, were said to be weighing on consumers' propensity to spend. Auto sales were mixed but fairly robust in most of the country, though some slowing was noted in the Northeastern regions. Widespread supply disruptions--primarily related to the disaster in Japan--were reported to have substantially reduced the flow of new automobiles into dealers' inventories, which in turn held down sales in some Districts. Widespread shortages of used cars were also reported to be driving up prices. Tourism activity improved in most Districts. Residential construction and real estate continued to show widespread weakness, except in the rental segment, where market conditions have strengthened and construction activity and development have picked up. Non-residential real estate leasing markets have been generally stable, while construction activity has remained very subdued. Loan demand was steady to stronger in most Districts, especially in the commercial and industrial sector, and widespread improvement was reported in credit quality. Agricultural conditions were unfavorable across much of the nation, largely reflecting unseasonably cool and wet weather; widespread flooding along the Mississippi River hampered agricultural production in the Atlanta and St. Louis Districts. In the Dallas District, in contrast, drought conditions hurt the wheat crop and led to broader damage from wildfires. The energy industry showed continued strength, with robust expansion in oil drilling and extraction activity. Labor market conditions continued to improve gradually across most of the nation, with a number of Districts noting a short supply of workers with specialized technical skills. Wage growth generally remained modest, though there were scattered reports of steeper increases for highly skilled workers in certain occupations. Most Districts continued to report widespread increases in commodity prices; manufacturers are said to be passing along a portion of the higher costs in the form of price hikes and fuel surcharges. Colbert: [00:40] But the government's never created one job. Colbert: [00:44] The government can't create jobs. That's an accepted maxim. Colbert [surprised, speaking quickly]: You agree? You agree with that? Colbert [continuing to be surprised]: You're agreeing that the government has never created one job. Goolsbee: In rescue mode, we saved a lot of jobs. Colbert: So you didn't create one. Colbert: [01:05] No, no, they never created any jobs. Goolsbee: ...our providing incentives to get the private sector to stand-up. We want the private sector to stand-up. We want the private sector to do the creation of the jobs. Colbert: That's what they always do. Goolsbee: That's what we want them to do. In case you missed it, that was the chief economic advisor to a "democratic" President refusing to disagree that government programs never created even one job, to the sputtering incredulity of his comic interlocutor. Amazing. FDR must be spinning in his grave. Apparently the 6 million CCC and WPA jobs that helped lower the Great Depression unemployment rate from 24% to 10% were illusory. [L]et me start by saying we always knew this was going to be a difficult year to govern -- an extraordinarily difficult year to govern. We began 2009 with a financial system on the brink of collapse, an economy bleeding nearly 700,000 jobs per month, a $1.3 trillion deficit, and two wars that were costly in every sense of the word. We knew that solutions wouldn't come easily or come quickly. We knew that the right decisions would be tough and sometimes they would be unpopular. And we knew that we might have to make them sometimes without any help from our friends on the other side of the aisle. But we made those decisions. We led. Those actions prevented another Great Depression; they broke the back of a severe recession. The economy that was shrinking by 6 percent a year ago is now growing at nearly 6 percent one year later. So the point I'm making -- and [Senator] Blanche [Lincoln] is exactly right -- we've got to be non-ideological about our approach to these things. We've got to make sure that our party understands that, like it or not, we have to have a financial system that is healthy and functioning, so we can't be demonizing every bank out there. We've got to be the party of business, small business and large business, because they produce jobs. We've got to be in favor of competition and exports and trade. We don't want to be looking backwards. We can't just go back to the New Deal and try to grab all the same policies of the 1930s and think somehow they'd work in the 21st century. That is as explicit an embrace of "trickle down" economics as you are ever going to see. Well, eighteen months later, it isn't clear that the Obama policies have "worked" or "broken the back" of Hard Times at all. So exactly why does Obama believe that "grabbing ... New Deal policies," and in particular a new WPA (that Bonddad and I were the first to propose, before the idea was endorsed by Profs. Reich, Thoma, or Krugman) wouldn't work? That "New Deal policies" were rejected out of hand, and neoliberal conservative talking points endorsed, is exactly why Obama's economic performance is being rejected by the majority of Americans, and his Administration is on the verge of failure. For most of the post-war period, declining real prices for clothing and especially food caused the relative amount spent on necessities to shrink. Spending on basic necessities other than shelter fell to a low of just 13.67 percent of all consumption expenditures in Q2 2002. But since then spending on necessities has been on a rising trend, interrupted only briefly by the recession in 2008 and early 2009. 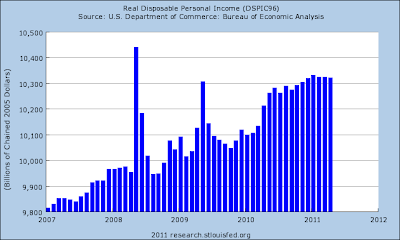 In Q3 2008, spending had hit 15.6 percent. 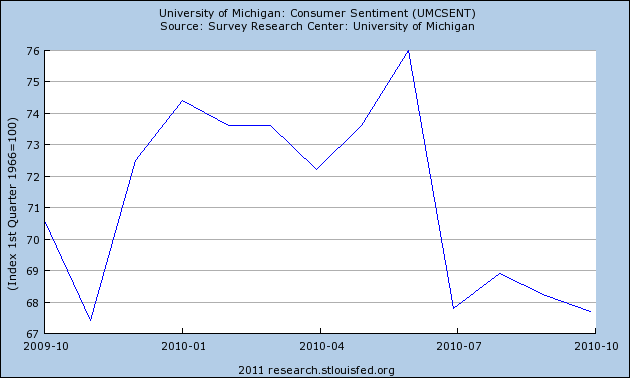 By Q1 2011 it was back to 15.0 percent and has almost certainly risen further in the last two months. In the final quarter of 2005, American households started allocated a higher percentage of their consumption expenditure to food, clothing and fuel than they had five years earlier, the first time in over six decades. Since then, the percentage has continued to creep steadily higher. 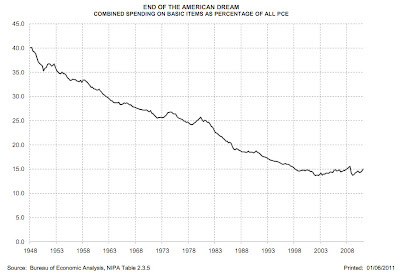 I don't think this is the end of the American dream as stated on Kemp's chart. But I do think it means the US consumer is under pressure to make harder choices regarding expenditures, which will slightly depress spending. We saw this in last months PCEs expenditures from GDP. Prices are still bounded by the two boundaries of roughly 97/98 and 104. The analysis above still provides the overall macro analysis. The commodity group of grains (soy beans, wheat and corn) are base products in the US food system; they are the building blocks of our food system. Not only do we eat grains in the forms of cereals and breads, but these are fed to cattle as nutrients and make-up a percentage of our energy costs in the form of ethanol. As such, their costs are part of our entire food complex. 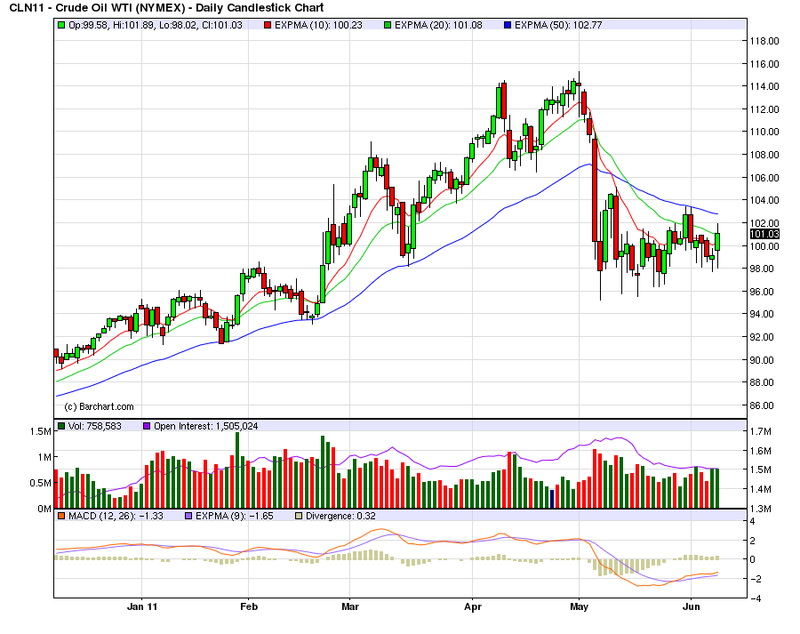 As the charts below show, the upward move for these commodities has stopped. But prices have not come down, either, meaning the US consumer will be under continued pressure to make difficult consumer choices. All the above charts show prices increasing and then stalling. There are two important conclusions to draw from these charts. The worst droughts in decades are wilting wheat fields from China to the U.S. to the U.K., overwhelming Russia’s return to grain markets and driving prices to the highest levels since 2008. Wheat may gain as almost half of the U.S. winter crop remained in poor condition, while rains in France, Germany and the U.K., the European Union’s largest shippers, may already be too late to reverse crop damage. The July-delivery contract rose as much as 0.4 percent to $7.47 a bushel on the Chicago Board of Trade before trading little changed at $7.4375 at 3:03 p.m. Singapore time. About 44 percent of the U.S. winter-wheat crop was rated poor to very poor as of June 5, unchanged from a week earlier, and up from 9 percent a year ago, the U.S. Department of Agriculture said yesterday. The winter crops probably were irreparably harmed by the driest weather in 50 years in France, the hottest spring in 352 years in England and dry weather in central Germany, Telvent DTN Inc. said yesterday. World food prices lingered near record levels in May as meat and dairy costs rose, contributing to inflationary pressures that may drive millions into hunger, even as grain prices fell. An index of 55 food commodities slid to 232.4 points from 234.8 points in April, the United Nations’ Food and Agriculture Organization said in a report on its website today. The gauge climbed to an all-time high of 237.7 in February. The FAO meat index climbed to an all-time high, led by record beef and sheep prices and higher poultry and pigmeat costs. Prices for staple foods including corn will more than double in two decades unless action is taken, Oxfam International said last week. World grain stocks will fall for a second year by the end of June 2012, the International Grains Council said May 26. The slow pace of spring sowings in Canada has dashed hopes of a rebuild in the country's inventories of grains and oilseeds, leaving them on course too fall below 10m tonnes for the first time in recorded history. Canada's farm ministry, AAFC, slashed nearly 900,000 tonnes from its forecast for total inventories of the likes of barley, canola and wheat at the close of 2011-12, reducing the estimate to 9.46m tonnes. The downgrade takes stocks below the 10.36m tonnes expected at the close of this season, to a "new record low level, 26% below the 10-year average", the ministry said, blaming the revision on a second successive season of wet spring sowing weather. "Seeding progress in parts of Saskatchewan and Manitoba is currently well behind schedule due to very wet soil conditions," AAFC said. "A significant portion of the area which was intended to be seeded… may not be seeded or harvested." The US faces the prospect of "basement levels" of inventories of spring wheat and durum thanks to the rains which have delayed plantings to one of the slowest paces on record. Alan Tracy, the president of industry group US Wheat Associates, said that the wet weather which had left 21% of the American spring wheat crop unplanted as of Sunday, when sowings are typically all but finished, was "going to have a drastic impact on supplies". Supplies were going to become "terribly tight" for both conventional spring wheat and durum, the variety used to make pasta which is, in the main, also spring seeded. "We are looking at a reasonable carryover coming into this year, but I do not think we are going to have a carryout," he told the International Grains Council's annual conference. "We are going to be down to bargain basement levels," Mr Tracy said. The US Department of Agriculture has estimated America's hard spring wheat inventories entering 2011-12 at 215m bushels, with those of durum pegged at 47m bushels. All of these stories indicate the upside pressure on food prices is increasing, not decreasing. U.S. economic growth so far this year looks to have been somewhat slower than expected. Aggregate output increased at only 1.8 percent at an annual rate in the first quarter, and supply chain disruptions associated with the earthquake and tsunami in Japan are hampering economic activity this quarter. A number of indicators also suggest some loss of momentum in the labor market in recent weeks. We are, of course, monitoring these developments. That said, with the effects of the Japanese disaster on manufacturing output likely to dissipate in coming months, and with some moderation in gasoline prices in prospect, growth seems likely to pick up somewhat in the second half of the year. Overall, the economic recovery appears to be continuing at a moderate pace, albeit at a rate that is both uneven across sectors and frustratingly slow from the perspective of millions of unemployed and underemployed workers. As is often the case, the ability and willingness of households to spend will be an important determinant of the pace at which the economy expands in coming quarters. A range of positive and negative forces is currently influencing both household finances and attitudes. On the positive side, household incomes have been boosted by the net improvement in job market conditions since earlier this year as well as from the reduction in payroll taxes that the Congress passed in December. Increases in household wealth--largely reflecting gains in equity values--and lower debt burdens have also increased consumers' willingness to spend. On the negative side, households are facing some significant headwinds, including increases in food and energy prices, declining home values, continued tightness in some credit markets, and still-high unemployment, all of which have taken a toll on consumer confidence. 2.) Gas prices are also a big part of the problem. As they increase, they choke off other consumer purchases. 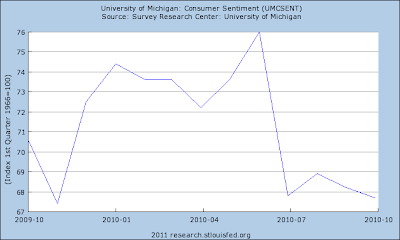 While consumers are still spending on gas -- which does increase GDP -- they also cut back on other purchases. This is what we saw in the latest retail sales report. 3.) Demand side issues are of paramount importance going forward. This makes complete sense, considering PCEs account for 70% of GDP growth. I would like to know exactly why these people believe that a short term default would either be a) short term or b) not trigger a credit event? Let's address "a" first. Once the "technical default" happens, what makes anyone believe that a deal will be quickly cut (and one where the Republicans get everything they want and the administration gets nothing). I would argue that once the event takes place, both sides will become more entrenched (since default has already happened and your positions haven't changed) which could easily lead to a dragged out fight (mostly in the press) but no movement and thus real risk of an actual default. Any dragged out fight after August 2, would also likely lead to another US recession, as credit market turmoil, uncertainty, and potential missed payments (to anyone ie doctors, seniors, defense contractors, etc) would lower GDP and cost US jobs. I simply do not believe it is appropriate to risk the full faith and credit of the US government to score a political victory. As for "b", I would love to know where Senator Sessions and Representative Ryan are getting their information from. Have they called around to our foreign creditors? How about pension funds? Are they talking with the folks who run treasury backed money market funds (remember, the breaking of the buck on a non-treasury backed money market was one of the tipping points of the panic of 08)? Their statements are not only horribly speculative, but also terribly risky, and if they are wrong we are staring at a black swan event that could make the recent panic look like a walk in the park as money/investment flees the US for another "safe-haven", which would further reduce our ability to obtain favorable credit and likely exacerbate the debt problem we already have. This week I want to look at the copper chart. As I mentioned before, copper has a strong correlation with the overall stock market. 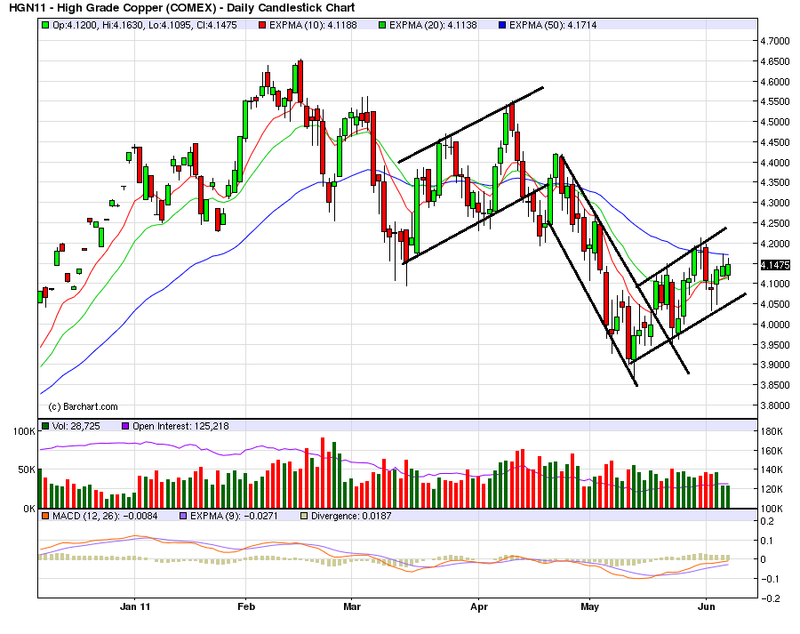 Right now, the copper market is in an up/down/up sell off, making a series of lower lows and higher highs. Prices have sold-off in three, well-disciplined channels. This is encouraging as it tells us that traders are not running for the hills, but slowing getting out of positions. While the shorter term trend (the 10 and 20 day EMA) is up, the shorter EMAs are below the longer EMA. Additionally, the longer-term trend is down and prices are using the EMAs as resistance rather than support. However, the MACD is moving higher. Right now, Dr. Copper is signaling further weakness. Shelby, among other things, stated Diamond supports QE2, the about-to-be-completed second round of so-called Fed quantitative easing. Guess who also supports it, in fact came up with it and implemented the QE2 policy: Bernanke and company. The claims about Diamond not being qualified don’t hold up well. Shelby has rhetorically asked whether Diamond has experience in conducting monetary policy. Who does before they actually get to help conduct monetary policy? Other credential-based objections seem surmountable. So, should a nominee not get to serve on the Fed because his views appear in line with the administration that nominated him and the majority of serving Fed policy makers? Seems like a dubious, if current, notion. The primary problem the economy currently faces is high unemployment. Maybe actually listening to people who have studied the problem -- and gotten really important awards for it -- is a good idea. I'm reminded of the scene in the movie Armageddon where they are talking about how to deal with the "planet killer asteroid," and the general rejects what the NASA scientist says. Billy Bob Thornton interjects, "This is Dr. So and So. He's the smartest guy on the planet. You probably want to listen to him." I'm deeply concerned that we're now at a point where we reject very qualified candidates because they might have a view of reality that is different from ours. That is a sign of intellectual immaturity of the highest order. Diamond's non-confirmation is a tragedy and shows just how incredibly stupid Washington has become. Yesterday CBS news published an article with the sensationalist headline: "Chronic unemployment worse than Great Depression" that has been getting prominent play in all of the usual places. It's a classic case of there being three types of lies: Lies, Damned Lies, and Statistics. About 6.2 million Americans, 45.1 percent of all unemployed workers in this country, have been jobless for more than six months - a higher percentage than during the Great Depression. In other words, it's statistic isn't the number of people who are long term unemployed, it's the percentage. Wait a second here: what the article says is that 45% of the unemployed (themselves, 9%) are long-term unemployed; and that the 45% is higher than during the great Depression. Unless the 9% unemployed is also greater than during the Great Depression, that's not a "this is worse than the Great Depression" equivalence. 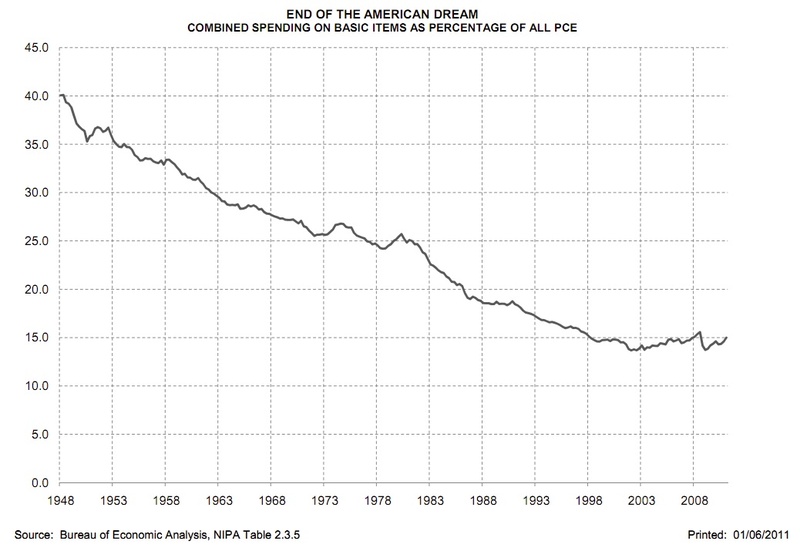 What's really relevant is the % of the total workforce that is long-term unemployed. I mean: what if the unemployment rate were 3%, but 100% of that were long-term unemployed? According to that article, we should say "this is worse than the Great Depression", which, of course, is nonsense. Watch it, when someone quotes percentages of percentages to you. Suppose you were in a hospital, bleeding from a severed artery. The doctors and nurses staunch most of the bleeding, but you are still losing a little blood. Compare that with a situation where the bleeding hasn't been staunched at all, and you are continuing to hemorrhage unabatedly. In the first case, most of your blood loss is "chronic" - it's old, but the blood is still lost. In the second case, it isn't, because the "old" blood loss is less of the current total. The current unemployment situation is bad, but the discourse is not helped in the slightest by misleading headlines with statistics contorted so that the phrase "worse than the Great Depression" can be used. Why Was Last Month's Employment Report Bad? We have to remember that this is just one month - even if the numbers were dismal. So far the economy has added 908,000 private sector jobs this year, or about 181 thousand per month. There have been 783,000 total non-farm jobs added this year or 157 thousand per month. The unemployment rate is still unacceptably high and there is painfully little attention being paid to this problem from the position of policy makers. However, the overall trend is still decent, save for one month of data. However, back to the question: why the one month drop? 1.) Japan: Motor vehicle parts employment lost 3,400 jobs last month. Japan is responsible for a large amount of motor vehicle production, meaning the after-effects of the earthquake are still hurting. 2.) Gas prices specifically and commodity prices generally. All of the regional Fed manufacturing reports and the latest ISM manufacturing report are littered with information indicating high commodity prices are starting to hurt. Remember that manufacturing now uses the "just in time" method of parts delivery, meaning that high fuel costs really hurt production and add to costs. As such, high gas prices really hurt the bottom line. 3.) We're in another period of economic uncertainty: in the EU, Greek concerns are again taking center stage. In the US, we have the budget issue in Washington. Now we have ratings agencies threatening to downgrade UIS debt (or, they're starting to think about downgrading US debt). Either way, this level of uncertainty freezes action. The drop a few months ago -- and the lack of any climb from that drop -- indicates consumers are not happy. And when that happens, they stop spending. We're already seeing signs of this in the latest GDP revisions and retail sales report. Decreasing sentiment means lower demand, which leads to businesses cutting back on production which leads to lower hiring numbers. As I pointed out in yesterday's market recap, last week's economic news was decidedly negative. As such, Treasuries are still an attractive investment. The IEFS are still in a clear uptrend. Prices have a firm trend in place, all the EMAs are moving higher and the shorter EMAs are above the longer EMAs. The A/D and CMF confirm that more money is flowing into the market and the MACD indicates that momentum is clearly in our favor, although decreasing a bit. In contrast, the TLTs are looking a bit weaker. Prices have broken their upward sloping trendline, and prices are using the EMAs for technical support. While the A/D and CMF are showing money moving into the market, the MACD has given a clear sell signal, indicating the rally at the end of the curve may be hitting some choppy water. Nobel laureate Peter Diamond, nominated three times by President Barack Obama to serve on the Federal Reserve’s board of governors, will ask the White House to withdraw his nomination in the face of Republican opposition. His NY Times editorial is here. The man won a Noble Prize for a paper that studies unemployment -- not that it's a major issue right now or anything. The Noble Prize means he's really smart -- he's probably forgotten more about econ than Shelby or his cohorts ever knew. This is pure, partisan garbage, plain and simple. There is no reason for this. It is another example of the abject stupidity of Washington. And an inside joke to NDD -- I couldn't get 24 hours. From Bonddad: This is, without a doubt, one of the best pieces NDD has ever written. I agree 100% with his conclusions on the topic. While I'll be posting on this topic something later this week, NDD has provided a far more thorough and well-researched article. There has been a secular shift in the American economy going back at least 4 years. The self-congratulatory "great moderation" was really the reflection of wage stagnation for the majority of Americans being masked by increased household debt loads, and the ability to carry those increased debt loads due to the ability to refinance them at lower and lower interest rates. This secular shift is a phenomenon I first wrote about at great length in 2007, asking Are Hard Times Near? That pessimistic prediction has been answered in a thunderclap-like affirmative ever since. I have returned to this issue several times during the last four years, writing last year under similar circumstances to our present slowdown that wage stagnation was the greatest threat to the recovery. Simply put, when there is only 1-2% wage growth per year, any inflationary spike - even a 3% spike due to energy increases - is enough to cause the economy to stall. There can be no long-term, sustained recovery for the large majority of Americans unless there is real, long-term wage growth. Thus, while at one level the current slowdown or stall is the result of an energy price shock, on another level it was predictable (and predicted by others and me) due to prices faced by consumers rising faster than their disposable incomes. only three times in the last 31 years: during the recessions of 1981-2, 1990-1, and the "great recession" of 2008-09. This result can be easily seen by showing real, inflation-adjusted YoY hourly wages, and also the effect of declining vs. stalling interest rates. The American consumer has had largely stagnant wages since 1974.... [F]rom 1980 through 2006, the median income of an American household has risen only from $39,700 to $48,200 in real terms .... Consumers have responded generally by taking on more and more debt. Total household debt service has risen from 16% in 1980 to 19.4% in 2006. There are signs that this "Great Disinflation" of declining interest rates is coming to an end. Only twice in the last 27 years has the consumer been unable to refinance debt or tap into his or her stock or house ATM.... [T]he 3rd and final time is almost certainly near. .... If consumers are unable to tap the value of assets, or to refinance, then without improvements in wages, they will pull back and cause a consumer-led recession. Since 1980, this has only happened twice: in the deep Reagan recession of 1981-82, and again briefly from July 1990 to March 1991. .... [T]he failure of interest rates to make new lows signifies that any continued deterioration in house prices, or significant and sustained decrease in stock prices, will likely give rise to an imminent recession danger sign. With the exception of the late 1990's tech boom, and those times in the last 10 years when energy prices briefly reversed, real hourly income has made no progress at all. The 1981-82, 1990, and 2008-09 recessions have all been accompanied by declines in real hourly income. Notice that there has been a general 30 year long decline in rates, punctuated by stagnant rates in the late 1980s, most of the 1990s, and the housing bubble era. This graph shows that stagnant or rising mortgage rates occurred at the same time as stagnant or declining real incomes (generally, when the red line is higher than the blue line in the graph above) during mid-cycle slowdowns at on the eve of or start of the post-1980 recessions. This was true by the end of 2007, it was true in last summer, and it has been true for the last few months. In order to avoid a recession, house price declines must stop, stock market gains must accelerate, or household income must increase significantly. Failing at least one these three things, if households have continued to cut back on debt, as appears likely, America will probably enter (or may already have entered) only its 3rd consumer recession since 1980.
the indicators studied from the Deflationary period of 1920-1950 suggest that the GDP might stop contracting in about Q3 2009, and start to actually grow. Whether the bottom of the trough of this decline in economic activity is in a few months, or if it is a year or two or more away, the fact remains that, with anemic wage growth to say the least, any incipient recovery ... would be short lived, strangled by the inflation caused by its own increase in demand. If the inflation rate agains exceeds wage growth, consumers will simply cut back again, plunging the economy into another leg down of a "W"-shaped recession. .... In summary, from here on ... we're not going to see any sustained recovery in the American economy until average Americans see a real and sustained increase in their compensation for labor -- for the first time in over 35 years. 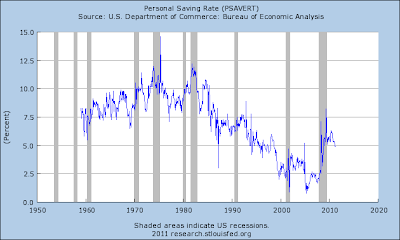 But there is still one more chance ... [i]f long term interest rates do decline again, consumers may yet have one more chance to refinance their spending for the next few years. .... While if lower mortgage rates persist, there will be space for an economic breather, the paradigm of my 2007 piece remains true. So long as real wages remain stagnant, any recovery which might start will be vulnerable to every uptick in inflation and interest rates, and will be shallow, weak, and probably short-lived. The Great Disinflation of Interest Rates is Ending, the long-term structural problems of our economy have become immediate problems as well, and no long-term recovery is going to take root without real wage growth. So with paltry income increases of about 1.5%, there are only two ways to sustain the recovery for very long: (1) the inflation rate remains in a very narrow window of 0-1.5%; (2) some asset held widely by average consumers appreciates in value. or (3) another opportunity arises to refinance mortgage debt. I thik we can all agree that number (2) doesn't look like it's going to happen. That leaves either number (1) or number (3). This is a very small needle to thread - so the biggest danger to sustaining the recovery. I have quoted my earlier material at length to show you that this isn't some new theory. I've been writing about it since before the "great recession" and indeed predicted both the beginning and bottom of the recession in large part based on this paradigm. It has proven itself empirically in the real world. When interest rates fall to new lows, consumers respond aggressively by refinancing debt, freeing up more spending power. When that isn't available, and when households can't cash in on rising asset prices (e.g.,houses or stocks) even inflation of only 2% can be enough in the face of stagnant real wages to choke off any real increase in consumer spending and the economy stalls - or worse. Aside from the need to prevent repeated energy price shocks throwing the country into recessions, among the most pressing priorities is the need to replace "supply side" economics with "demand side" economics that tilt the scales in favor of real, sustained wage increases for average Americans. Without that, there can be no long-term strong recovery or expansion. The market was closed on Monday and tread water on Tuesday. Prices dropped hard on Wednesday, moved sideways on Thursday, and gapped lower at the open on Friday and sold-off into the close. This is not a bullish chart. Prices are now below key support levels and have broken through the lower support line of a downward sloping channel. 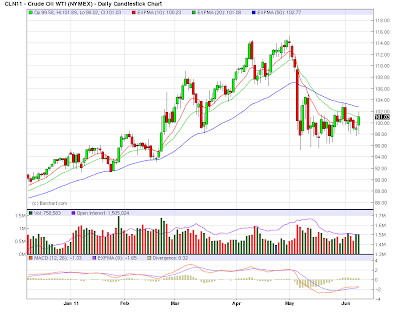 The 10 day EMA has crossed below the 50, and the 20 is about to cross below the 50. The shorter EMS are moving lower. On the longer chart, prices have clearly broken long-term support. The QQQs have also broken long-term support and are below key support levels. The IWMs have also broken key, long-term support and are right at key shorter support levels. All of the major averages have now broken long-term support lines and the economic news is decidedly negative. I would be looking for shorting opportunities with a price target of the 200 day EMA.